Expert on diseases of the nails and also disorders of the nail that indicate systemic disease, Dr Antonella Tosti leads this issue of Dermatologic Clinics. In the article "e;Tips to Treat 5 Most Common Nail Disorders"e; readers will find treatment options for brittle nails, onycholysis, paronychia, psoriasis, and onychomycosis, with a practical treatment algorithm. In the article "e;Ti… ps for Diagnosis and Treatment of Nail Pigmentation"e; physicians will be able to determine when to wait and see, when to biopsy, and when to excise a pigmented nail lesion. In "e;Tips to Diagnose Uncommon Nail Disorders"e; physicians will understand nail disorders that are not very common and should be able to easily diagnose after reading this article. 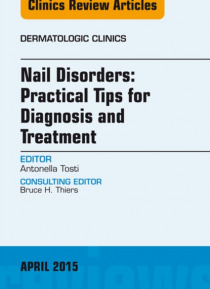 A novel and unique approach in "e;Tips to Diagnose Nail Diseases from Localization"e; covers Proximal and lateral nail folds, Nail matrix, and Nail bed/hyponichium. The section on "e;Tips that Make Nail Surgery Easy"e; presents practical and simple methods to Obtain a good anesthesia, Perform a punch biopsy; Treat an ingrown toenail, and Best way to remove a subungual tumor; each is accompanied by a technique video. The issue concludes with "e;Tips to Obtain the Best from your Lab,"e; addressing submitting specimens the right way and using nail clippings for diagnosis beyond fungal diseases; topics are What can be diagnosed with a nail clipping and How to submit a nail specimen.